Gifts from the Pirates: "Some painters transform the sun into a yellow spot, others transform ayellow spot into the sun." "Some painters transform the sun into a yellow spot, others transform ayellow spot into the sun." When I was at school I dreaded sports day. To me, it always seemed that if you were popular and quite sporty you were fine but if you had minimal interest in sports you were most likely going to come in last and then get ridiculed by everyone else. That was secondary school though when (let's be honest) the kids are a little more harsh. 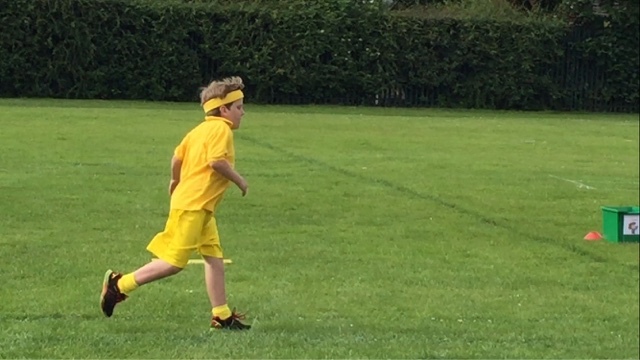 Last week was Seth's sports day and although he really wasn't looking forward to it, his usual positive attitude kicked in and he just got on with it. He was on the yellow team and informed us a week before that he needed to dress in the team colour. Mrs. M being 'super mom' got straight on her computer and ordered yellow shorts, Tshirt, socks, and sweatband, swish! Although Seth struggles with his muscle condition and mobility issues, he didn't let that get him down. With each race he was focused on that finish line (it does help when you've got a proud mom and little brother running alongside the track cheering you on though). We were so proud of him and I loved watching him giving it his all. Go, yellow team!